Classic, Eastside, Upper Canyon Road adobe. Originally built by Betsy Lynette Wooliver, daughter of legendary primitive folk painter, Streeter Blair. 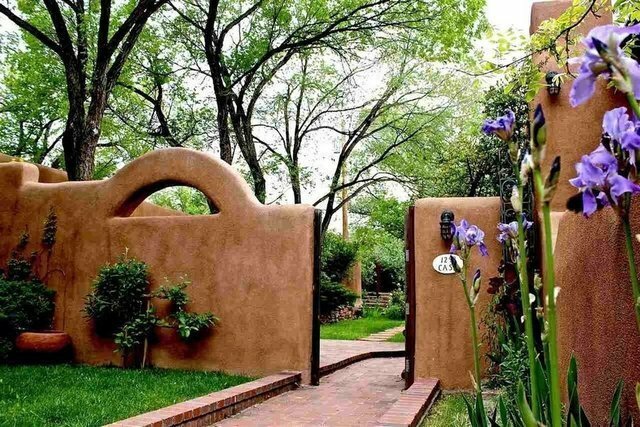 Featured in the seminal 70âs Santa Fe, counter culture book - Mud, Space and Spirit: handmade adobe. The home, once a renowned bohemian enclave, is now a masterfully remodeled, timeless residence, with classic details, modern ease, and intimate luxury. Antique and reclaimed wood doors, vigas, floors and counters. Copious amounts of wall space for displaying artwork. Independently zoned radiant heat and air conditioning with âœNest" learning thermostats. High efficiency windows and utilities. Venetian plaster and American clay hand-contoured adobe finishes. Wide plank, Ash wood and terra cotta tile floors. Two moss rock fireplaces, a large adobe Shepherdâs fireplace, and three kivas. Custom hardware, antique leaded-glass, hand-wrought iron balcony railings and light fixtures. Open and casually elegant dining room with large picture windows, french doors, views to the foothills and terraced gardens. French country kitchen, with Sub-Zero and Wolf appliances, a reclaimed oak bar, old-world hand-painted tiles and a butlerâs pantry. A very private, gated property, with meandering moss rock walls, large established trees, lawns,and perennial gardens, uniquely sighted on one of Santa Feâs most Iconic roads.